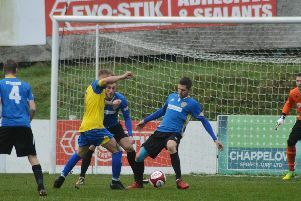 Stocksbridge Park Steels boss Chris Hilton is calling for his side to end the season on a high by targeting maximum points from the remaining four games. Steels ended a run of six games without a win with a 4-2 victory over promotion chasing Bedworth United at Bracken Moor on Tuesday with Brodie Litchfield netting a hat-trick added to a late goal from leading scorer Joe Lumsden. “That’s the longest win-less run we’ve been on since I’ve been here,” said Hilton. “We’ve got four games left, we want to try and win them all starting with Peterborough on Saturday. We want to get as many points on board as possible and make sure we finish in that top ten. Hilton was delighted with the performance against Bedworth, with key players absent. “We played some really good football and could have had more than the four we scored. It was a really pleasing performance and shows what we can do when we’re on our game. “When you consider we had four players missing, Matt Reay, Fadz (skipper Liam McFadyen), Tom Charlesworth and Luke Mangham and were forced into playing a makeshift centre pairing of Todd Jordan and Richard Stirrup, it makes it even a better performance. Stocksbridge thumped Peterborough 9-1 in the reverse fixture back in September but the visitors arrive having lost just one of the last six and will be keen to avenge what was an embarrassing defeat. Sheffield FC play their penultimate home game of the season as Bedworth United make a second visit to the city in five days with the visitors looking to avoid a repeat of the 4-2 defeat at Stocksbridge. With Club having already secured their Division One South status the pressure will be off Chris Dolby’s side. But that cannot be said of Bedworth who will be keen to secure their place in the play-offs. Frickley Athletic go to Gresley knowing they are possible just one win away from mathematically securing a place in the play-offs. Although Spencer Fearn’s in-form side -third in the table - already look to have done enough after winning six of a seven match unbeaten run. Shaw Lane go to mid-table Stafford Rangers with work to do if they are to secure a Premier Division play-off spot. The Ducks were four-points outside the top five ahead of last nights home clash against leaders Altincham. Premier Division: Buxton v Sutton v Coldfield Town, Matlock Town v Workington, Stafford Rangers v Shaw Lane. Division One South: Gresley FC v, Frickley Athletic, Sheffield FC v Bedworth United, Stocksbridge Park Steels v Peterborough Sports.